The holder of a stylized mark for CHEFMASTER won the UDRP case filed against the matching domain name, Chefmaster.com. The domain was registered in 1998, while the trademark registration dates back in 1956. There was no response by the Respondent, and attorney John Berryhill was the Complainant’s attorney. David A. Einhorn, Panelist at the National Arbitration Forum delivered a decision favoring the Complainant, Byrnes & Kiefer Co., and ordered the domain to be transferred. Full details on this UDRP decision for Chefmaster.com follow. Complainant is Byrnes & Kiefer Co. (“Complainant”), represented by John Berryhill, Pennsylvania, USA. Respondent is Domain Administrator / Fundacion Privacy Services LTD (“Respondent”), Panama. 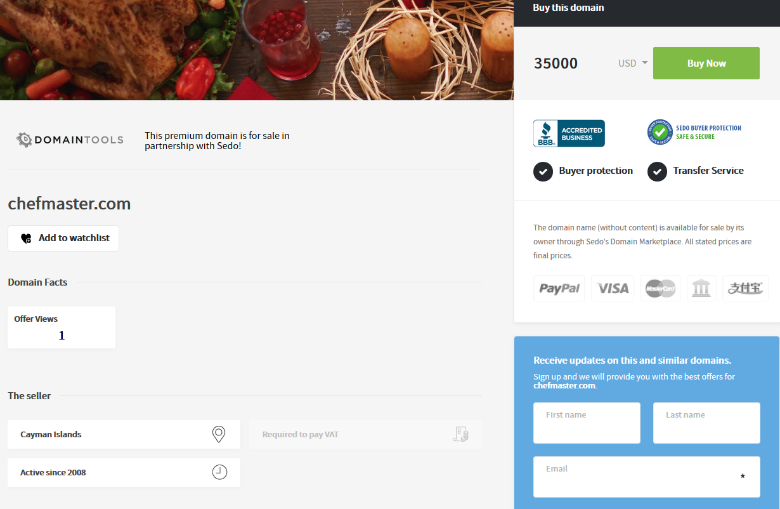 The domain name at issue is <chefmaster.com>, registered with Media Elite Holdings Limited. Complainant submitted a Complaint to the Forum electronically on December 19, 2018; the Forum received payment on December 19, 2018. On December 21, 2018, Media Elite Holdings Limited confirmed by e-mail to the Forum that the <chefmaster.com> domain name is registered with Media Elite Holdings Limited and that Respondent is the current registrant of the name. Media Elite Holdings Limited has verified that Respondent is bound by the Media Elite Holdings Limited registration agreement and has thereby agreed to resolve domain disputes brought by third parties in accordance with ICANN’s Uniform Domain Name Dispute Resolution Policy (the “Policy”). On December 21, 2018, the Forum served the Complaint and all Annexes, including a Written Notice of the Complaint, setting a deadline of January 10, 2019 by which Respondent could file a Response to the Complaint, via e-mail to all entities and persons listed on Respondent’s registration as technical, administrative, and billing contacts, and to postmaster@chefmaster.com. Also on December 21, 2018, the Written Notice of the Complaint, notifying Respondent of the e-mail addresses served and the deadline for a Response, was transmitted to Respondent via post and fax, to all entities and persons listed on Respondent’s registration as technical, administrative and billing contacts. On January 14, 2018, pursuant to Complainant’s request to have the dispute decided by a single-member Panel, the Forum appointed David A. Einhorn as Panelist. Complainant engages in the business of providing edible food colors, and has provided these goods and services for over seventy-five years. Complainant has rights in the CHEFMASTER, (Stylized) mark through its registration of the mark with the United States Patent and Trademark Office (“USPTO”) (e.g. Reg. No. 625,114, registered Apr. 10, 1956). Respondent’s <chefmaster.com> domain name is identical to Complainant’s mark as the second-level portion of the domain name consists of the CHEFMASTER word in its entirety. Respondent has no rights or legitimate interests in the <chefmaster.com> domain name. Respondent is not commonly known by the disputed domain name, nor has Complainant authorized, licensed, or otherwise permitted Respondent to use the mark. Respondent also does not use the disputed domain name in connection with a bona fide offering of goods or services or legitimate noncommercial or fair use. Rather, Respondent currently uses the domain name to distribute malware to unsuspecting users by requiring visitors to download a browser plug-in software. Prior to the current use, Respondent used the domain name to commercially benefit from competing pay-per-click links. Respondent registered and uses the <chefmaster.com> domain name in bad faith. Respondent uses the domain name to distribute malware to Internet users attempting to visit the domain name. Further, Respondent previously used the domain name to offer competing pay-per-click links for commercial gain. Additionally, Respondent is a habitual cybersquatter who has been involved in hundreds of UDRP proceedings resulting in Respondent’s transfer of domain names. Respondent failed to submit a response in this proceeding. The Panel notes that the <chefmaster.com> domain name was registered on July 23, 1998. Complainant claims rights in the CHEFMASTER mark through its registration of the mark with the USPTO (e.g. Reg. No. 625,114, registered Apr. 10, 1956). Registration of a mark with the USPTO sufficiently confers a complainant’s rights in a mark for the purposes of Policy ¶ 4(a)(i). See Humor Rainbow, Inc. v. James Lee, FA 1626154 (Forum Aug. 11, 2015) (stating, “There exists an overwhelming consensus amongst UDRP panels that USPTO registrations are sufficient in demonstrating a complainant’s rights under Policy ¶ 4(a)(i) and its vested interests in a mark. . . . Due to Complainant’s attached USPTO registration on the principal register at Exhibit 1, the Panel agrees that Complainant has sufficiently demonstrated its rights per Policy ¶ 4(a)(i).”). Accordingly, the Panel finds that Complainant has established rights in the CHEFMASTER mark for the purposes of Policy ¶ 4(a)(i). Complainant next argues that Respondent’s <chefmaster.com> domain name is identical to Complainant’s mark as the second-level portion of the domain name consists of the CHEFMASTER word in its entirety. The Panel agrees, and finds that the <chefmaster.com> domain name is identical to the CHEFMASTER mark under Policy ¶ 4(a)(i). Complainant contends that Respondent has no rights or legitimate interests in the <chefmaster.com> domain name. Where a response is lacking, relevant information includes the WHOIS and any other assertions by a complainant regarding the nature of its relationship with a respondent. See Braun Corp. v. Loney, FA 699652 (Forum July 7, 2006) (concluding that the respondent was not record, gave no indication that the respondent was commonly known by the domain names, and the complainant had not authorized the respondent to register a domain name containing its registered mark). The WHOIS identifies “Domain Administrator / Fundacion Privacy Services LTD” as the registrant. Complainant asserts that no evidence exists to show that Respondent has ever been legitimately known by the CHEFMASTER mark. Panels may use such assertions as evidence of lacking rights or legitimate interests. See Navistar International Corporation v. N Rahmany, FA1620789 (Forum June 8, 2015) (finding that the respondent was not commonly known by the disputed domain name where the complainant had never authorized the respondent to incorporate its NAVISTAR mark in any domain name registration). Complainant alleges that Respondent has never been legitimately affiliated with Complainant, has never been known by the domain name prior to its registration, and Complainant has not given Respondent permission to use the mark in any manner. Accordingly, the Panel agrees that Respondent is not commonly known by the <chefmaster.com> domain name under Policy ¶ 4(c)(ii). Next, Complainant argues that Respondent currently uses the <chefmaster.com> domain name to distribute malware to unsuspecting users by requiring visitors to download a browser plug-in software. Using a domain name to download malware onto a users’ computer can indicate a lack of rights and legitimate interests in a domain name under Policy ¶¶ 4(c)(i) and (iii). See Snap Inc. v. Domain Admin / Whois Privacy Corp., FA 1735300 (Forum July 14, 2017) (“Use of a disputed domain name to offer malicious software does not constitute a bona fide offering or a legitimate use per Policy ¶ 4(c)(i) & (iii).”). Complainant provides a screenshot of the current message displayed when attempting to access the disputed domain name, which initially displays the message “Security Check” and requires users to select the “I’M HUMAN” button, and proceeds to require users to download software onto the users’ computer. Accordingly, the Panel agrees with Complainant and holds that Respondent’s use of the domain name in connection with malware does not amount to any bona fide offering of goods or services or a legitimate noncommercial or fair use under the Policy. Further, Complainant claims that prior to the current use, Respondent used the <chefmaster.com> domain name to commercially benefit from competing pay-per-click links. Using a domain name to offer links to services in direct competition with a complainant generally does not amount to any bona fide offering of goods or services or a legitimate noncommercial or fair use. See Ashley Furniture Industries, Inc. v. domain admin / private registrations aktien gesellschaft, FA1626253 (Forum July 29, 2015) (“Respondent is using the disputed domain name to resolve to a web page containing advertising links to products that compete with those of Complainant. The Panel finds that this does not constitute a bona fide offering or a legitimate noncommercial or fair use.”). Complainant provides historical screenshots of the resolving webpages associated with the disputed domain name, which shows that the domain name appeared to offer various advertisement links such as “Candy Making” and “Coloring” from January 23, 2008 through May 25, 2016. Accordingly, the Panel agrees and finds that Respondent’s use of the domain name to offer competing hyperlinks fails to confer rights and legitimate interests in the domain name for the purposes of Policy ¶¶ 4(c)(i) or (iii). Thus, Complainant has satisfied Policy ¶ 4(a)(ii). Complainant contends that Respondent is a habitual cybersquatter who has been involved in hundreds of UDRP proceedings resulting in Respondent’s transfer of domain names. A complainant may use prior adverse UDRP decisions against a respondent in the current proceeding to evidence bad faith under Policy ¶ 4(b)(ii). See Fandango, LLC v. 21562719 Ont Ltd, FA1464081 (Forum Nov. 2, 2012) (“Respondent’s past conduct and UDRP history establishes a pattern of registered domain names in bad faith under Policy ¶ 4(b)(ii).”). Complainant provides a list of UDRP cases in which Respondent has been ordered to transfer domain names. Accordingly, the Panel finds that Respondent registered the <chefmaster.com> domain name in bad faith under Policy ¶ 4(b)(ii) based on Respondent’s prior UDRP history. Next, Complainant claims that Respondent previously used the domain name to offer competing pay-per-click links for commercial gain. Using a disputed domain name to offer competing hyperlinks can demonstrate bad faith under Policy ¶¶ 4(b)(iii) & (iv). See Health Republic Insurance Company v. Above.com Legal, FA1622088 (Forum July 10, 2015) (“The use of a domain name’s resolving website to host links to competitors of a complainant shows intent to disrupt that complainant’s business, thereby showing bad faith in use and registration under Policy ¶ 4(b)(iii).”); see also American Council on Education and GED Testing Service LLC v. Anthony Williams, FA1760954 (Forum Jan. 8, 2018) (“Respondent’s hosting of links to Complainant’s competitors demonstrates bad faith registration and use of the <geddiploma.org> domain name pursuant to Policy ¶ 4(b)(iv)”). Complainant’s provided historical screenshots associated with the disputed domain name show that the domain name appeared to offer various advertisement links such as “Candy Making” and “Coloring” from January 23, 2008 through May 25, 2016. Accordingly, the Panel agrees that Respondent offered competing hyperlinks through the domain name, which is indicative of bad faith under Policy ¶¶ 4(b)(iii) & (iv). Additionally, Complainant avers that Respondent uses the <chefmaster.com> domain name to distribute malware to Internet users attempting to visit the domain name. Use of a domain name to install malware onto a users’ computer can evidence bad faith under Policy ¶ 4(a)(iii). See eNom, Incorporated v. Muhammad Enoms General delivery / Enoms.com has been registered just few days after Enom.com, therefore could not have been regstere, FA1621663 (Forum July 2, 2015) (“In addition, Respondent has used the disputed domain name to install malware on Internet users’ devices. The Panel finds that this is bad faith under Policy ¶ 4(a)(iii).”). Complainant provides a screenshot of the current message displayed when attempting to access the disputed domain name, which initially displays the message “Security Check” and requires users to select the “I’M HUMAN” button, and proceeds to require users to download software onto the users’ computer. As such, the Panel holds that Respondent’s use of the domain name in connection with malicious software constitutes evidence of bad faith under the Policy. Thus, Complainant has also established Policy ¶ 4(a)(iii). Accordingly, it is Ordered that the <chefmaster.com> domain name be TRANSFERRED from Respondent to Complainant.